A passionate business woman, educator and mother, Atiti Sosimi developed the idea for Shhh or Tell it when she was looking for ways to encourage her family to learn from each other by openly sharing and discussing their thoughts, feelings, experiences and anxieties about life as a whole. She felt a board game was an excellent way to get family and friends to play, talk, share, deliberate and give a greater insight into how they think and feel and what influences how they make their decisions in a safe, non-judgmental and engaging way. Shhh or Tell it became an ideal way to confront serious issues alongside fun issues and situations in a healthy balanced setting. Shhh or Tell it presents life-like dilemma scenarios which requires each player to consider how they would tackle each dilemma, and decide to either Shhh or Tell the scenario within 15 seconds. By having to make a choice players become reflective of how they deal with similar dilemmas in their real lives. 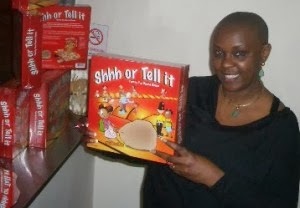 Shhh or Tell it soon became more than a family board game and has been used as a team building exercise in corporate settings and for student character development programmes in schools. The board game also has a Facebook app called Shhh or Tell which allows users to share their own real-life dilemmas with friends, app users or anonymously using social media to get responses on how to deal with their dilemmas. “This board game is about having fun and learning! It enhances team work, challenges group thinking and strengthens confidence in individual choices.” says creator, Atiti who took 5 years to develop this concept into a highly successful board game. The quality of the game and simplicity of the gameplay is testament to Atiti’s hard work. Atiti is another example of how Mumpreneurs around the world do great things every day! Will you “Shhh or Tell it” this year?